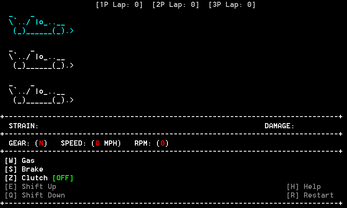 Ayrton is a turn-based ASCII racing simulator designed to test both your patience and your skills. Being an enthusiast of Formula One racing simulators, we wanted the player to really feel the frustration of not knowing how to manage the car through the first turn of the track; the game forces the player to take a step back and really get to know how to operate and control the vehicle, as opposed to simply pressing on the gas and going like many racing games of this era. It is quite a challenging game, but once you get the hang of it, you might just enjoy yourself! The game doesn't come with sound effects, so you'll have to supply your own. Rev up engine to 2000+ RPM. Shift up to 1st gear. 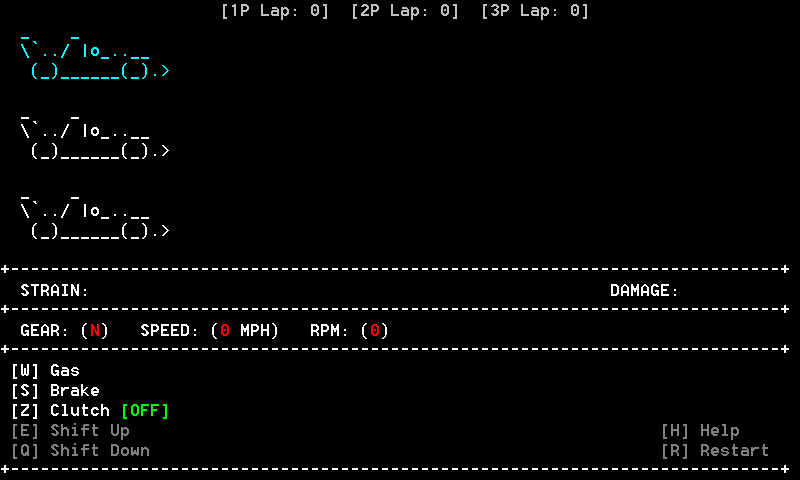 You must have 2000+ RPM when shifting gears. When shifting gears and accelerating, you will lose RPM. Be careful! You cannot accelerate when the clutch is on. Shifting gears without using the clutch will strain your engine. Having RPM in the red zone will also strain your engine. If you strain your poor, dear engine too much, it will stall! Keep your MPH in the green zone to maintain ideal speed.